절에 행사가 있을때 절의 입구에는 당(幢)이라는 깃발을 달아두는데 이 깃발을 달아두는 장대를 당간(幢竿)이라 하며, 장대를 양쪽에서 지탱해 주는 두 돌기둥을 당간지주라 한다. 이 당간지주는 부석사 입구에 1m 간격을 두고 마주 서 있다. 마주보는 안쪽 옆면과 바깥면에는 아무런 장식이 없고, 양쪽 모서리의 모를 둥글게 다듬었다. 기둥 윗부분은 원을 2겹으로 경사지게 조각하였고, 옆면 3줄의 세로줄이 새겨져 있다. 기둥머리에는 깃대를 단단하게 고정시키기 위한 네모 모양의 홈이 파여 있다. 기둥 사이에는 한 돌로 된 정사각형의 받침 위에 원형을 돌출시켜 깃대를 세우기 위한 자리가 마련되어 있다. 이 주변에는 연꽃을 장식하고, 윗면 중앙에는 구멍을 뚫어 당간의 밑면을 받치고 있다. 대체로 꾸밈을 두지 않아 소박한 느낌을 주는 지주이다. 또한 가늘고 길면서도 아래위에 다소 두께 차이가 나 있기 때문에 오히려 안정감을 주며, 간결하고 단아한 각 부분의 조각으로 보아 통일신라 전기의 작품으로 추정된다. 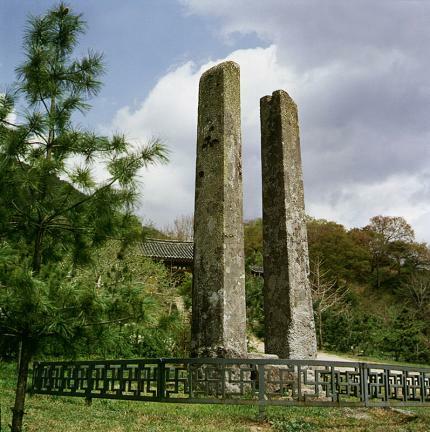 Flagpole supports are a pair of stone supports to hold flag poles used for special occasions at a temple. 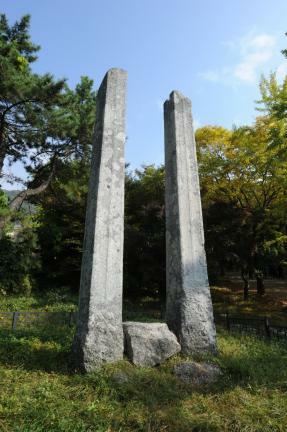 Located at the entrance of Buseoksa Temple, these bases of flagpoles are a meter apart from each other. 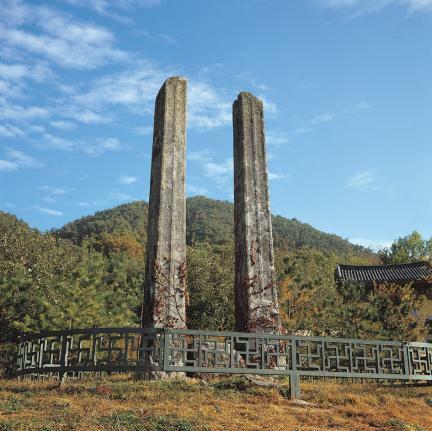 There is no decoration on the inside and outside of these two supports, but there are circles and three vertical stripe patterns carved into it. The square hole near the top of the supports was to hold the banner poles. The motif adorning the round stone base is of lotus petals. 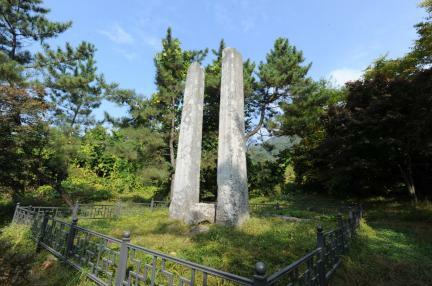 The simple and refined technique by which the supports were made indicates that they were erected in the Unified Silla period.